On the heels of the chaotic rollout of the EOS mainnet, EOS block producers have frozen seven accounts that were compromised through a phishing scam, leading to a constitutional crisis for the EOS government. The problem began when several accounts fell victim to a phishing scam, but the event has turned into another debate about EOS' governance model. A group of block producers is accused of exceeding its authority by freezing seven affected accounts after the EOS Core Arbitration Forum refused to issue a decision on the case. A member of the top 21 block producers, known as EOS42, stated that following the election of EOS block producers, a flood of reports began pouring in from token holders who claimed their private keys were invalid and didn't match their assigned addresses. The security breach put $15 million worth of tokens at risk. 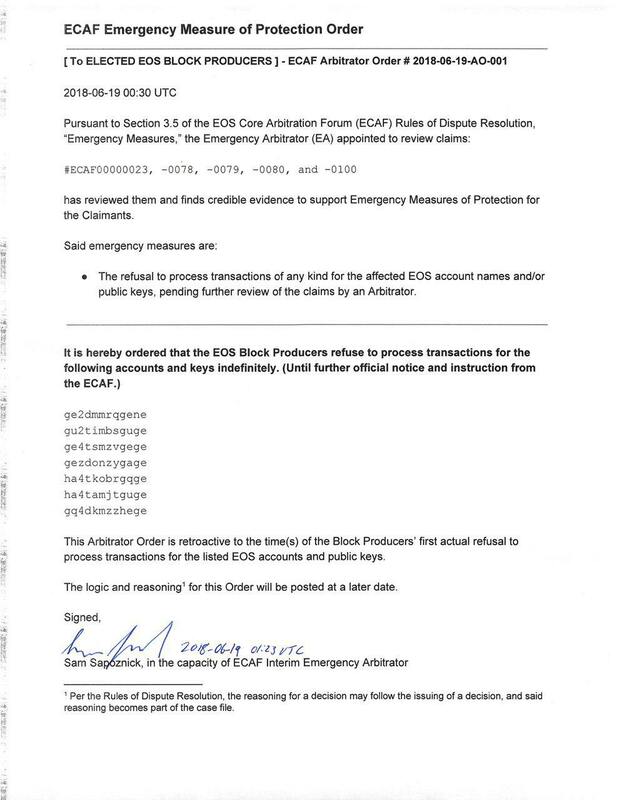 "We initially received a preliminary notice from ECAF that they were likely to issue an emergency order to freeze certain accounts affected by the scams," EOS New York, another of the top 21 block producers, wrote in a statement. However, these block producers, according to EOS New York, were later informed that the forum would not issue such an order. Instead, ECAF announced it did not believe the interim constitution granted it any authority to do so. "On the one hand we could protect token holders, on the other this on the surface appears a dramatic overstep of our role in the constitution and BP agreement, which is to be the executor only of arbitration decisions, not to also be judge and jury." The move was met with significant online criticism. "Should further potentially compromised accounts be unlocked during this period before the constitution is ratified, we will consider these and whether to freeze." However, such steps are not likely to be necessary. Yesterday, EOS New York demanded that the ECAF issue a ruling by 13:00 UTC on June 19, threatening to unfreeze the accounts if the forum failed to do so, as the freeze "cannot be enforced without unanimous consensus by all top 21 Block Producers." Apparently, the threat worked: The ECAF has now ordered the freeze to be maintained indefinitely. Like what you read? Follow us on Twitter @ETHNews_ to receive the latest EOS, freeze or other Ethereum ecosystem news.